Rocky intertidal shores occur at the interface between the terrestrial and marine environments. This unique location results in a physical complexity that leads to high biological diversity, including many species that are found only in this narrow band of coastal habitat. Rocky shores are also the most accessible marine habitat, which fosters a strong public appreciation of these communities, but also makes them vulnerable to degradation resulting from human activities. Natural temporal variation in rocky intertidal systems can be quite high, and can occur on the scale of months (seasonal), years, and even decades, so long-term monitoring is essential for separating natural change from human-induced. Because rocky intertidal communities are highly diverse and subject to constant change, monitoring of these areas must be done in a well-designed, systematic manner, over long periods of time. Our monitoring program began with the goal of developing an approach that would enable researchers to collect statistically sound data using methods that were simple enough to maintain over the long-term, using minimal resources, and has grown into a consortium of groups that now monitor sites along the entire Pacific Coast of North America, from Alaska to Mexico, and several East Coast sites in Maine and New Hampshire. Rocky intertidal areas tend to be dominated by several “key” species, which often form distinct vertical bands/zones along the shoreline. These species shape the community by creating habitat for other species, or through activities such as grazing or predation. Our Long-Term Monitoring approach, developed by a consortium of organizations collectively called “MARINe” (Multi-Agency Rocky Intertidal Network), focuses on these key species, with the idea that changes in these species will impact other species in the community. This targeted approach allows us to detect relatively small changes in the abundance of species, at effort levels that can be sustained for the long-term. Targeted species are monitored within fixed plots annually or semi-annually. Layered upon this “core” approach are the additional goals of documenting species richness and changes in the distribution of species within and among sites over time. 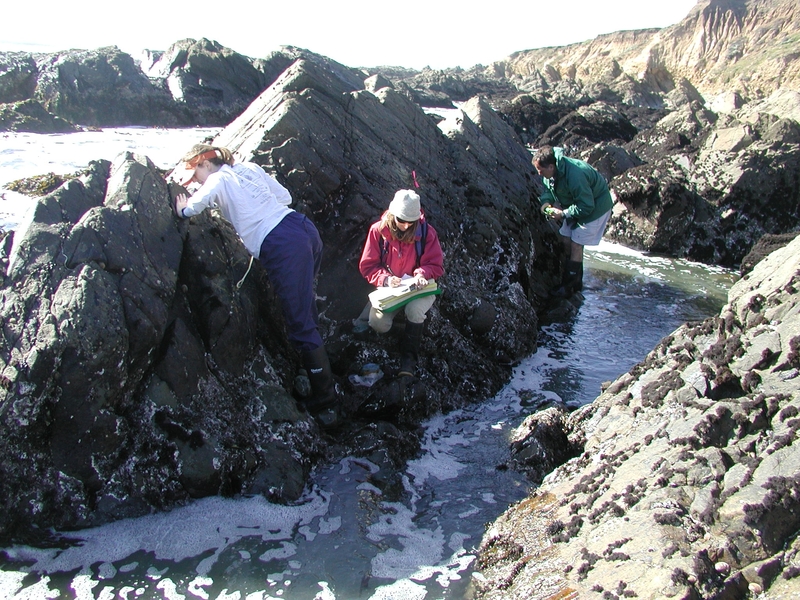 Biodiversity Surveys, designed to capture information about the rocky intertidal community as a whole (rather than targeted species) are used to address these goals. These surveys are much more intensive and require a high-level of expertise and consistency in the identification of marine organisms, and are thus done by a single group at UC Santa Cruz and on a less frequent schedule, typically every 3-5 years. 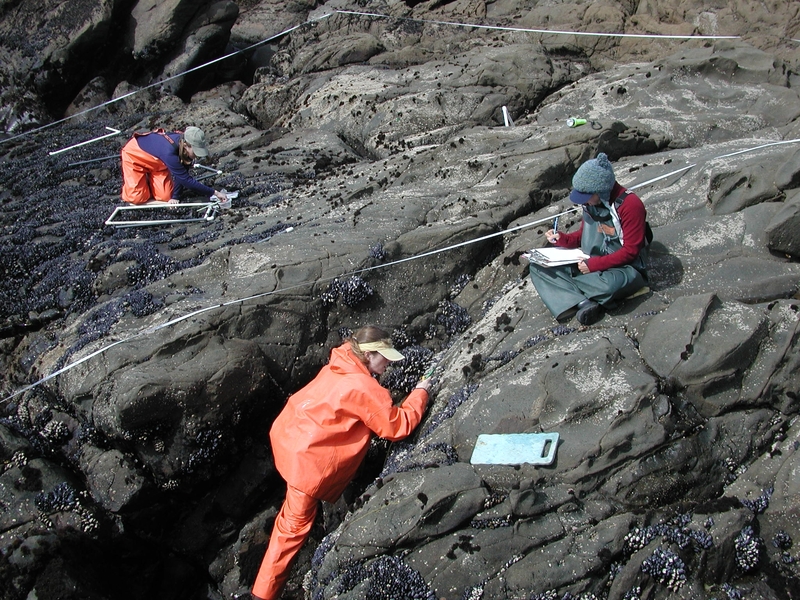 In combination, the long-term, targeted species approach and the biodiversity surveys provide a wealth of information about the structure and dynamics of rocky intertidal communities along the Pacific Coast of North America. Our monitoring program is the largest, and longest-running of its kind; sites in some regions have been sampled for 20-30 years. The long-term information about the dynamics and diversity of rocky intertidal habitats enables us to: 1) Assess impacts due to natural and human induced disturbance events (e.g. El Niño events, oil spills), 2) Detect shifts in community make-up due to factors such as disease, species introductions, and climate change, and 3) Provide context for more focused experimental work.